achieves over 200,000 downloads worldwide! SNK CORPORATION (Corporate HQ: Suita-city, Osaka, Japan, Company President & CEO: Koichi Toyama) is proud to announce that in cooperation with HAMSTER Corporation (Corporate HQ: Setagaya-ku, Tokyo, Japan, Company President & CEO: Satoshi Hamada) the ACA NEOGEO series of download games which have been licensed from SNK and released for the Nintendo SwitchTM have reached a milestone of over 200,000 downloads worldwide (as of April 26th, 2017). The concept behind the ACA NEOGEO series for the Nintendo SwitchTM is to faithfully reproduce and release timeless masterpieces from SNK’S NEOGEO library on the Nintendo SwitchTM. Starting from the launch on March 3rd, titles have been added on a weekly basis with a total of 14 titles available at this time. 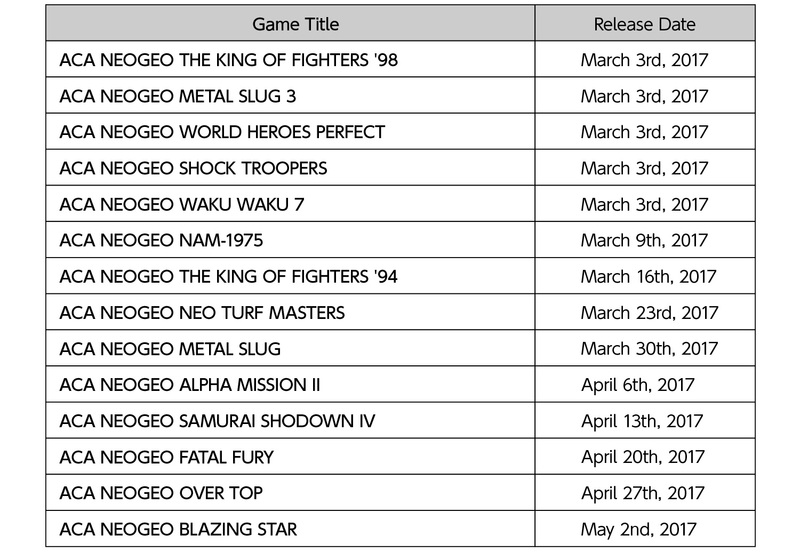 There are even more releases in the ACA NEOGEO series coming in the future, and we look forward to the continued support of our fans going forward.